As I started writing this, I was still on my, “Oh my gosh, what a night!” high. This past weekend was the first competition of the year for Lake Area Dance Center (LADC) as a whole. 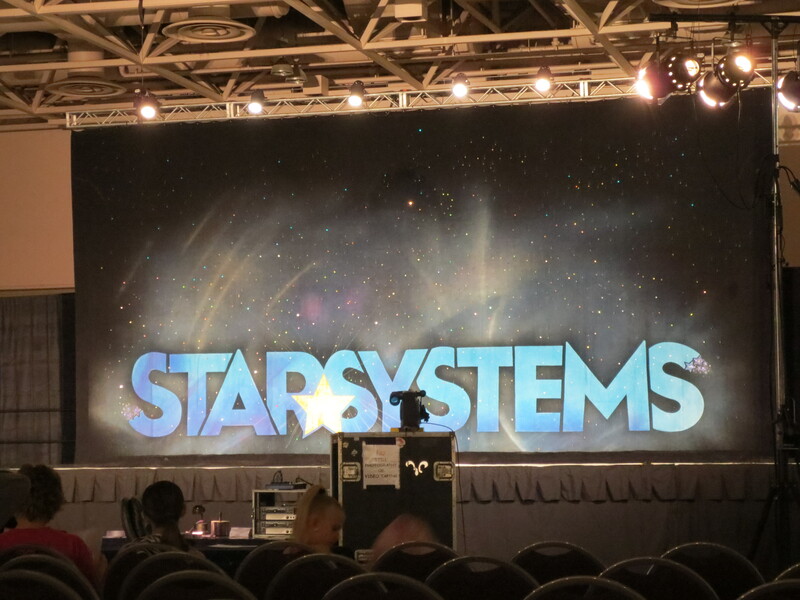 This weekend, our girls are dancing at Star Systems at the Minneapolis Convention Center. There were things I liked and didn’t like about this venue and the competition as a whole, but more on that later…. We got an email earlier in the week letting us know that this would be a smaller competition than some we have attended in the past, and that we should make sure to be there, with the dancers ready to go, at least 2 hours early. We went about 4 hours before that time, because this would likely be the one competition we would be able to catch all the solos and trios, as well as have the opportunity to watch the younger girls. We didn’t get quite as early a start as I had hoped, but we still managed to catch the last 2 solos of our group, and all the trios. We also got to watch all the large and small group dances. It was awesome being able to watch some of the numbers we rarely get to see, and to watch them win awards! We were a bit nervous about the super fast change times between numbers. The girls were scheduled to dance their tap dance first, then 2 songs later, dance jazz, and two songs later, dance lyrical. Everyone was a bit nervous about that time frame. Luckily for our girls, they were able to dance their tap dance quite a bit earlier than their placement in the schedule, so they had a bit of time to change, etc. The downside of this, was that they had minimal warm-up and practice time (though many had been practicing on their own throughout the day). I snapped a few pictures of Grace and her friend practicing (and goofing around) before I heard them announce that pictures were not allowed in ANY area within the ballroom where the competition was to be held. I knew pictures/videos would not be allowed of the stage area (even wrote a post about it), but did not realize the photo ban included the entire area of the competition. This was a bummer, because the entire competition area was in one large room. There was a concession stand in the back, with a nice area of seating for people to eat and socialize. From back there, the music wasn’t too loud, but loud enough. You could see the stage, though the dancers were difficult to see. One thing about the concessions at the Convention Center, is that the prices were expensive! It was $4 for a hotdog that came with nothing else. I got a small order of breadsticks for around $3.25. They were good, but small. To be able to get a better view of the dancers, you had to move up to the seating area close to the stage. The music was QUITE loud up there. I think it’s nearly impossible to find a good balance where the music doesn’t overwhelm the audience, yet the dancers can still hear it. The competition staff seemed to turn on some kind of microphones on the stage during some tap numbers. That always sounded odd over the music, but was probably quite useful for the judges. Other features they had included the “shopping table”. Here you could get programs, pins, shirts, sweats, and a few clothing items you don’t normally find. I thought the prices for programs were a little high at $12/piece, but other items were more reasonable. Star Systems does not give pins to dancers for their achievements, they give ribbons. I was happy to see that pins were available that just said Star Systems for only $3. I got one for Grace to add to her lanyard of dance pins. There was also the section of computers where you could view pictures and videos of individual numbers. I forgot to check out Grace’s dances, since the schedule was a bit crazy. The good news, is that photos are available to view/purchase online. One last thing I really liked about this venue was that they had an attached, yet separate “practice space.” After being at multiple competitions over the past several years, this was something greatly appreciated. Many competitions are filled with dancers practicing in any, and every free space. There was plenty of space to move around here without fear of getting in the middle of a routine that was being practiced. This competition was divided into several categories. By age, it was Mini (8 & under), Junior (ages 9-12), Teens (age 13-15), and Seniors (age 16-18). There was also the competitive levels of Shining Star (what is probably most well known as “recreational” level), Shooting Star (most commonly known as “intermediate”), and Super Star (“advanced” or “elite”). 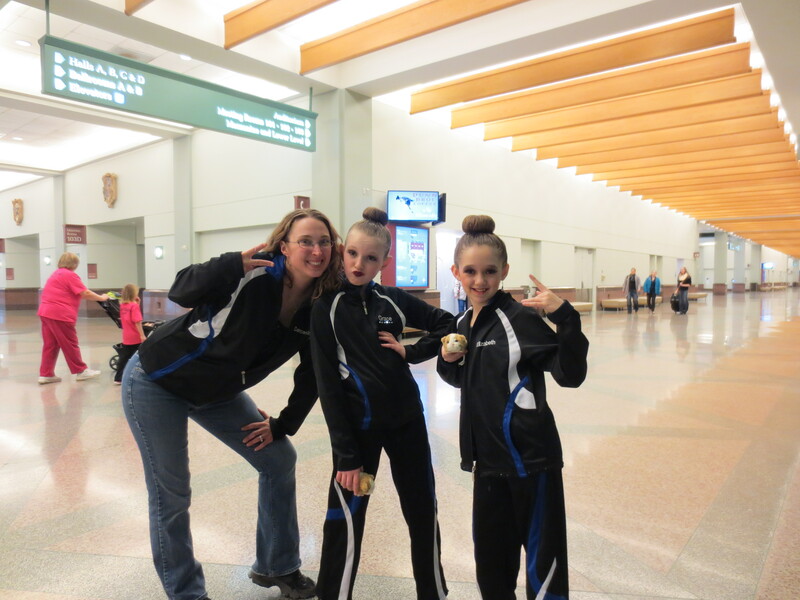 LADC’s mini groups competed at the Shining Star level. Our juniors (Grace’s age category) danced at the Shooting Star level. I mentioned that it was a pretty small competition, there were probably less than 10 studios overall. Many were from our area. There was 4th Street Dance Centre (4SDC) and Lorenz Dance & Tumbling, both within 10 miles of our studio. My daughter was surprised to see some of her classmates from middle school on stage with other studios, when she didn’t even know they danced. We also saw some great small group and solo dances by Kinkade Dance Industries and QC Dance. I know there were a few other studios there too. I mentioned the close time frame of the schedule earlier. I also mentioned that our girls were able to do their tap dance a bit early. While it was a pleasant surprise to see the desks (my daughter’s prop/set) being hauled onstage when I expected to see one of our mini groups perform their jazz dance, I was also a bit flustered by the unexpected. I would have gladly helped get them out and set up. The schedule at Star Systems jumped all over the place. I’m sure the small numbers, and needs for multiple costume changes probably played a huge role in that. It was still frustrating trying to figure out where they were at, and who might dance next. Speaking of crunched time spans, in Grace’s lyrical dance, she has a minor costume change. While it’s just a matter of peeling off scrubs, and getting a hair clip put in, she was very nervous about it. I stood at the side of the stage with clip in hand. As soon as she was off, we did the quick change, and she made it on time to get back out for her next part. It’s different watching the performance from the sideline, rather than the front. For those who haven’t been to dance competitions before, the scoring system can be a bit confusing. Each dance is given a score. Depending where their score falls, each dance will receive a High Silver, Gold, High Gold, or Platinum score. For the first time ever, Grace’s dances were all three scored at the Platinum level. It was a huge night for all of them, and a really big deal to Grace! After they tell each dance how they scored, they are then given a ranking. This is the typical 1st, 2nd, 3rd place most people are used to. They often announce the top 5, though, sometimes, they will recognize up to 10th place. Grace’s group scored 1st overall for tap, 2nd for jazz, and 3rd for lyrical. WOW!! At the end of the evening, they gave out two Extra Special Awards. These were the Ultimate Achievement Awards. This is the highest scoring number overall. They gave away two: one in the Junior Shooting Star division, one in the Junior Super Star division. Grace’s tap dance to “Heads Will Roll” won this special award. Overall achievement award for highest scoring dance of the day + 1,2,3 placement = Grace so excited! My Mom bought her a trophy that says platinum. After the competition, we attempted to gather everyone together for a group photo. While it was a bit like herding cats, and some of the teachers and dancers that had been there all day were getting a bit loopy, we managed to capture a few decent shots. We did not attend the teen/senior competitions on Sunday, but Lake Area Dance scored very well then too. They even won the Shooting Star Ultimate Achievement award for dancers age 13 +. So proud to be part of a studio that did so well! This competition had the potential for LADC to take home A LOT of trophies and plaques. They gave them for category winners (there were many sub-categories that I didn’t even talk about), also for rankings. Something cool they did though, was gave studios the option of not accepting trophies for category winners, instead, they could choose to have the competition donate the values to charity. Studios who wanted to participate could choose to donate to Sandy Hook (in honor of the dancers who were killed in the school tragedy), St. Jude Children’s Fund, or Susan G. Komen Breast Cancer Research Fund. Our studio opted to donate to Sandy Hook rather than bring home a truckload of trophies. I thought this was very cool, and each dancer in a group number still got a ribbon. They did still receive trophies for 1st place, and for the Overall Achievement awards as well. In a couple of weeks, Lake Area Dance will head to Hall of Fame for their next competition. I look forward to seeing what this (much larger) competition will bring for our girls! Interesting….we had a very very similar experience with this competition today. We were instructed to have our girls present and ready to dance 1 1/2 hrs prior to the stated schedule time. We were told the awards ceremony would start 1 hour earlier than the stated time. We arrived slightly earlier than requested for the routine, and started 2 hrs later. We had a 4 hr or so gap in between the last performance and the awards. We elected to go out for a beach visit. We returned 1 hour 15 minutes prior to the start of the awards…the awards ceremony had begun 15-20 minutes prior to our return and concluded within 5 minutes of our return. The spokesperson seemed extremely rushed when issuing the awards; almost bothered. Needless to say, my daughter was completely devastated. I had a really tough time calming her down. Don’t get me wrong, if you can start early great but inform the participants so we can adjust our plans. Additionally, as you have indicated, the appearances of the dance teams were literally all over the place and difficult to gauge progression of the competition. That is SO unfortunate!! I’m not sure, but the competitions seem to be getting more and more ahead each year. It makes for a very stressful day for parents, teachers, and dancers alike! Ok. Thanks. This is our first year and I do not want yo deter my 8 year old. She really enjoys dance and this was the first issue ever. She is great now, but we had to treally work with her because she was sad. Thanks again. Just plan on always being there at least 2 hours before you need to be, and USUALLY you will be ok.